As a technology enthusiastic and a blogger, I know the importance of including screenshots when reviewing applications or writing posts in general. In my experience I think that, this mainly serves two purposes. First, it helps readers to get a far better understanding about the topic and secondly, since words (especially mine ;-)) can be quite boring, adding an image or two help to keep the readers excited enough (so that they’d read from the start to the end, hopefully :D). And at the end, a post looks much better with screenshots, which gives me a sense of an accomplishment as it helps to keep me on going as well ;-). Anyhow, one of the annoying issues with Windows while taking screenshots is that, for some reason, it does not include you mouse pointer. Perhaps it’s not that necessary all the time, however, I’d appreciate if they somehow provided us the ability to include the mouse pointer manually. I honestly don’t know if you can actually enabled/disable this somehow in Window and although the never versions of Windows such as Vista and 7 do include a tool called “Snipping Tool” which is pretty good as it contains few tools (such as a pen, highlighter and an Eraser) to deal with screenshots. Still, it’s pretty much a basic utility and again cannot capture the mouse pointer. And after taking a screenshot, for basic editing tasks, we can use the “MS Paint” application but due to varies reasons, most of the time you’d be better of with a third party screenshot taking tool. 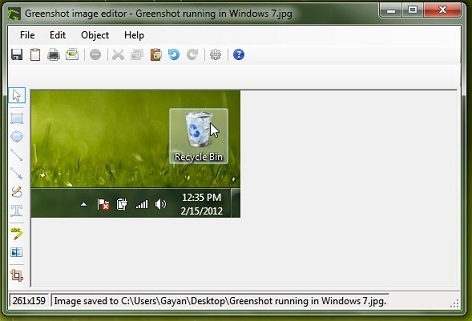 So if you’re looking for a completely free, fully open-source (GNU GPL licensed) yet an extremely powerful screenshot taking tool that can be used in Windows, then Greenshot is certainly an elegant little application that you should try. It’s still at its beta stage, yet it worked really well in my Windows 7 nonetheless. *. Greenshot lets you include/exclude the mouse pointer while taking screenshots (ahh, some peace at last! ;-). *. Has a lot of built in tools such as: a selector, eclipse and rectangle selectors, draw lines and arrows (another pretty handy feature! ), free-hand drawing tool, highlight, add-text box, obfuscate (blurring effect) tool and a free cropping tool. *. Copy the screenshot to your clipboard, so you can edit in any other tool (such as MS Paint if you like). *. Keep the transparency of windows (if you use the “Aero” effects). *. Add a delay prior to taking a screenshot. *. You can capture the whole screen, the last region, currently selected window or use your mouse to select any area of the screen. *. Supports saving captured images in: PNG, JPEG (you can adjust the quality, another benefit to fine-tune things a bit more), BMP, GIF and Tiff. *. 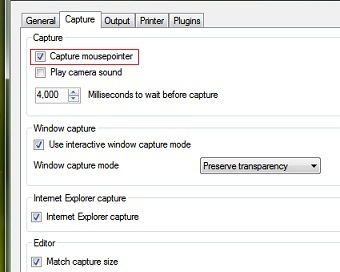 The above mentioned “selected window capture” mode even lets you select individual areas of the selected window (for instance if you were capturing Windows file Explorer, then you can capture areas such as the URL field, left-sidebar or the right side content area only etc with ease) which is pretty cool. *. Now, Greenshot has to run in your system tray (as it has to override the “PrntScr” executions etc), you can use its “Preferences” window to adjust a lot other individual settings such as making it load automatically at each system start-up, printing related settings, changing the shortcut keys etc. *. For never computers, this might not be an issue, however, it uses somewhat decent amount of your RAM (about 25-30MB while I was using it) which might concern some. As said, this is still at its beta stage, so you might come across with few issues. But while I was testing it (gonna keep it! ), it worked without any issues whatsoever. So as an ending note, if you want a features rich screenshot taker (with mouse pointer capturing) that can be used in Windows and okay with its somewhat heavy RAM usage, then Greenshot deserves to be tried in my humble opinion. If you want to try it, then please get it from this Greenshot home page. Good luck.